اسماعیلی, ندا, قربانی, مریم, بی پروا, پوریا. (1396). بررسی ویژگی‌های فیزیکی چوب صنوبر (Populus deltoides) اصلاح شده با گلوتارآلدئید/پارافین. مجله صنایع چوب و کاغذ ایران, 8(4), 617-630. ندا اسماعیلی; مریم قربانی; پوریا بی پروا. "بررسی ویژگی‌های فیزیکی چوب صنوبر (Populus deltoides) اصلاح شده با گلوتارآلدئید/پارافین". مجله صنایع چوب و کاغذ ایران, 8, 4, 1396, 617-630. اسماعیلی, ندا, قربانی, مریم, بی پروا, پوریا. (1396). 'بررسی ویژگی‌های فیزیکی چوب صنوبر (Populus deltoides) اصلاح شده با گلوتارآلدئید/پارافین', مجله صنایع چوب و کاغذ ایران, 8(4), pp. 617-630. اسماعیلی, ندا, قربانی, مریم, بی پروا, پوریا. بررسی ویژگی‌های فیزیکی چوب صنوبر (Populus deltoides) اصلاح شده با گلوتارآلدئید/پارافین. مجله صنایع چوب و کاغذ ایران, 1396; 8(4): 617-630. در پژوهش حاضر اثر اصلاح ترکیبی گلوتارآلدئید/پارافین بر خواص فیزیکی چوب صنوبر بررسی شد. اصلاح با گلوتارآلدئید در 3 غلظت 5، 10 و 20 درصد در حضور کاتالیزور کلرید‌منیزیم و متعاقباً، اشباع نمونه‌های اصلاح ترکیبی با پارافین به‌روش خلا-فشار انجام ‌شد. بر‌اساس نتایج طیف‌سنجی، واکنش گلوتارآلدئید با پلیمر‌های چوب به افزایش گروه‌های متیلنی و کاهش گروه‌های هیدروکسیل انجامید. دو شاخه‌شدن پیک گروه هیدروکسیل با افزایش غلظت گلوتارآلدئید از 10 به 20درصد، موید تشکیل همی-استال بود که طی آزمون دوره‌ای غوطه‌وری- خشک‌کردن، سریع‌تر از استال هیدرولیز و به کاهش وزن بیشتر منتهی‌شد. اصلاح گلوتارآلدئید با مسدود کردن گروه‌های هیدروکسیل و حجیم‌شدگی دیواره سلولی، موجب کاهش ورود آب به داخل چوب، و با برقراری پیوند عرضی موجب کاهش انعطاف‌پذیری چوب جهت واکشیدگی شد. پارافین نیز با کاهش اثر موئینگی، نفوذ آب به‌داخل چوب را تقلیل بخشید. عدم تثبیت پارافین در چوب و خروج آن، موجب افت‌وزن سطوح اصلاح ترکیبی با افزایش زمان غوطه‌وری گردید. Neimsuwan, T., Wang, S., Taylor A.M. and Rials, T.G., 2008. Statics and kinetics of water vapor sorption of small loblolly pine samples. Wood Science and Technology, 42:493-506. Hoadley, R.B., 1980. Understanding wood. A craftsman’s guild to wood technology, Taunton Press, 280 p.
 Hill, C.A.S., 2006. Wood modification: chemical, thermal and other processes. Wiley Chichester in renewable resources. Wiley and Sons: Chichester, Sussex, UK, 239p. Xiao, Z., Xie, Y., Militz, H. and Mai, C., 2009. Modification of wood with glutaraldehyde. In: Proceedings of the 4th European conference on wood modification, Stockholm, Sweden. Yasuda, R. and Minato, K., 1994. Chemical modification of wood by non-formaldehyde cross-linking reagents. Part 1. Improvement of dimensional stability and acoustic properties. Wood Science and Technology, 28:101–110. Yasuda, R., Minato, K. and Norimoto, M., 1994. Chemical modification of wood by nonformaldehyde crosslinking reagents. Part 2. Moisture adsorption and creep properties. Wood Science and Technology, 28:209–218. Xiao, Z., Xie, Y., Militz, H. and Mai, C., 2010. Effect of glutaraldehyde on water related properties of solid wood. Holzforschung, 64:475–482. Xiao, Z., Xie, Y., Adamopoulos, S. and Mai, C., 2012. Effects of chemical modification with glutaraldehyde on the weathering performance of Scots pine sapwood. Wood Science and Technology, 46:749–767. Scholz, G., Adamopoulos, S. and Militz, H., 2011. Migration of blue stain fungi within wax impregnated wood. International Association of Wood Anatomists, 32:88. Berninghausen, C.G., Rapp, A.O. and Welzbacher, C.R., 2006. Impregnating agent, process for impregnating of dried and profiled wood, and wood product impregnated therewith. Patent EP1660285. Kurt, R., Krause, A., Militz, H. and Mai, C., 2008. Hydroxymethylated resorcinol (HMR) priming agent for improved bondability of waxtreated wood. Holzforschung Roh - Werkst, 66(5):333-338. Scholz, G., Militz, H., Gasco´n-Garrido, P., Ibiza-Palacios, MS., Oliver-Villanueva, J.V., Peters, B.C. and Fitzgerald, C.J., 2010. Improved termite resistance of wood by wax impregnation. Int Biodeterior Biodegrad, 64:688-693. Lesar, B., Kralj, P. and Humar, M., 2009. Montan wax improves performance of boron-based wood preservatives. Int Biodeterior Biodegrad, 63:306-310. Lesar, B., Pavlicˇ, M., Petricˇ., M, Skapin, A.S. and Humar, M., 2011. Wax treatment of wood slows photodegradation. Polymer Degradation and Stability, 96:1271-1278. Esteves, B., Nunes, L., Domingos, I. and Pereira, H., 2014. Improvement of termite resistance, dimensional stability and mechanical properties of pine wood by paraffin impregnation. European Journal of Wood and Wood Products, DOI 10.1007/s00107-014-0823-7. Akrami, A., Doost Hoseini, K., Jahan Latibari, A. and Faezipour, M.M., 2008. Investigation on The Effect of Paraffin content, Press Time and temperature on Practical Properties Especially Surface Roughness of Particleboard. 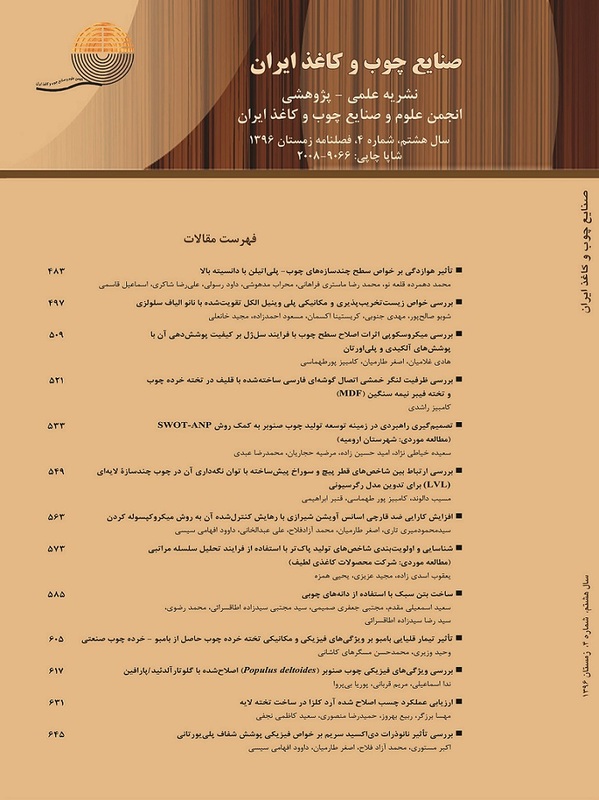 Iranian Journal of Wood and Paper Science Research, 23 (1): 50-62. Scholz, G., Krause, A. and Militz, H., 2012. Volltra¨nkung modifizierten Holzes mit Wachs. European Journal of Wood and Wood Products, 70:91–98. Mehmet, C., 2007. Effects of some impregnation chemicals and water repellents on the hygroscopicity of beech wood. Wood Science and Technology, 52(1):87-98. Standard Test Method for Anti-Swelling Effectiveness of Water-Repellent Formulations and Differential Swelling of Untreated Wood When Exposed to Liquid Water, American Society for Testing and Materials, ASTM Standard, D4446-05, 2005. Li, Y., Dong, X., Liu, Y., Li, J., and Wang, F., 2011. Improvement of decay resistance of wood via combination treatment on wood cell wall: Swell-bonding with maleic anhydride and graft copolymerization with glycidyl methacrylate and methyl methacrylate. International Biodeterioration & Biodegradation, 65: 1087-1094. Standard Test Methods for Density and Specific Gravity (Relative Density) of Wood and Wood-Based Materials, ASTM D2395-14e1 Standard, 2014. . Ohmae, K., Minato, K., Norimoto, M., 2002. The analysis of dimensional changes due to chemical treatments and water soaking of hinoki (Chamaecyparis obtusa) wood. Holzforschung, 56:98–102. Ohmae, K., Minato, K., and Norimoto, M., 2002. The analysis of dimensional changes due to chemical treatments and water soaking of hinoki (Chamaecyparis obtusa) wood. Holzforschung, 56:98–102. Xie, Y., Callum, A., Hill, S., Xiao, Z., Mai, C., and Militz, H., 2011. Dynamic water vapour sorption properties of wood treated with glutaraldehyde. Wood Science and Technology, 45:49–61. Mansouryar, I., 2010. Dimensional Stability of Poplar Wood by Paraffin Emulsion, Quaternary Ammonium and Hydrated Starch using Full-cell Treatment. Iranian Journal of Wood and Paper Industries, 1(1):79-89. Doost Hoseini, K., 2001. Production technology and the use of compact wooden plates. University of Tehran Press, Tehran, 708 p. (In Persian). Suzuki, H., Takahashi, H. and Endoh, K., 1976. On water absorbability of dry procces fiberboard. Mokuzia Gakkaishi, 22(10):557-563.